Throughout history, the Jewish people have gone through successful and wealthy periods, but desperate times as well. Until 1496 there had been 150 Jewish communities in Portugal, each one having its own worship places and institutions. But that year brought an end to their communities, forceful conversion to Christianity and expulsion from Portugal. Many religious sites, walls, carvings and gates were destroyed, but Judaism in Portugal didn’t completely vanish; its traces remained in inscriptions, historic markers, place names and local tales. When traveling to Portugal, especially on guided senior tours that delve into the history of the area, you’ll see firsthand the touches of Jewish life that once thrived there. Before you start your Jewish journey to Portugal, here is a list of places that deserve attention and tell the story of Jewish communities. The trade and culture of the capital city of Portugal flourished thanks to the contribution of the Jewish citizens. Once in Lisbon, take a tour to Baixa, the commercial and financial center of the city. There, you will find two important Jewish quarters: the Judiaria Pequena and the Judiaria Grande. The Igreja da Conceicao Velha, in Rua da Alfandega, is a church, remarkable for its Manueline doorway. It is said that the church had been built on the remains of an old synagogue. Another area that is significant for Jewish history is the Praca Dom Pedro (the court of the Inquisition was held in this place). Areas like Alfama and Belem were also home to some Jewish quarters. Alfama holds a collection of tombstones with the inscriptions written in Hebrew, and some of Belem’s museums still hold exhibits of Jewish scientists’ works. Many other museums in Lisbon display the presence of Jews in the city, including the City Museum (Museu da Cidade) and the National Museum of Ancient Art (Museu Nacional de Arte Antiga). The small historic town of Tomar was once a refuge place for the Knights Templar. They built a monastery and fortress which are still intact and were turned into a museum. The oldest existing synagogue in Portugal was built here in 1438. The synagogue was also used as a prison and church during the period of forced conversion. In 1921 it was declared a national monument and turned into a museum. Another museum in the area is The Abraham Zacuto Luso – Museo Hebraico. It has a small collection of Judaica, architectural fragments and works of art. It is considered to be the best preserved medieval synagogue in Portugal, the Synagogue of Tomar, built by a thriving Jewish community between 1430 and 1460. Over the next few centuries, the building changed its purpose several times. Since 1939, it serves as the museum. This remote and small village is of huge importance in Jewish history; for centuries, many Jews secretly practiced their religion right in this area. A Jewish community that survived over the centuries and still exists today was established here. In 1910, a stone of the first Belmonte synagogue, built in 1297, was found during the demolition of São Francisco’s Church. Other places in the area that tell about Jewish history are: the Jewish Museum of Belmonte, Jewish Quarter and signage of Jewish/religious marks and the Jewish Museum and Hebrew tombstone from 1297. Evora is a monumental city where one of the largest Jewish communities existed until the 15th century. The community had a hospital, two synagogues, baths, lively commerce and a Midrash. The Jewish heritage can be seen on a set of Gothic pointed arch portals that belonged to the community residents’ houses. Evora was also a center of the Portuguese Jewish court. Porto is home to one of the oldest Jewish communities in the world and a major Jewish merchant community. 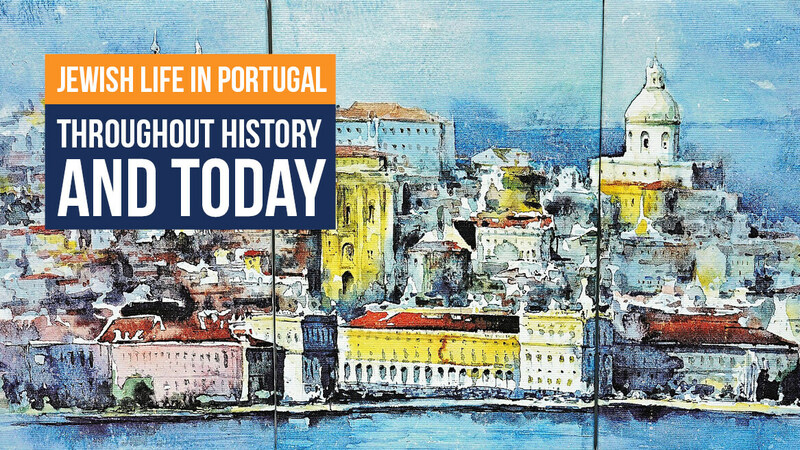 It harmoniously co-existed with the Christian communities until the 15th century when they were expelled from Portugal. During the Inquisition, Jewish heritage was completely destroyed. It was a place of secret synagogues, wealthy Jews and good trade relations between Christians and Jews. In 1826 a Hebrew plaque was unearthed. A place nowadays called Escadas da Esnoga is where the main synagogue of the early Jewish community stood. This is another small place in Portugal with a vibrant Jewish community. It is described as one of the best preserved Portuguese medieval towns. By the end of the 15th century, a significant Jewish community settled in the area after their persecution during the Inquisition. Jews that settled in the area established their quarter and built whitewashed cottages with distinctive granite, gothic doorways and a small square with the town fountain (Fonte da Vila) made of granite and marble. A synagogue, dating back to the 13th century, is turned into a museum and chronicles the life of the town’s Jews.